At AK Material Handling Systems, we realize not every storage application happens on a huge scale. Sometimes it’s not engineered racking systems, but rather a few units of sturdy steel shelving that are needed. That’s why we’re a stocking distributor of industrial steel shelving. Whether you need a single unit of shelving on which to store your tools or a 100′ run of heavy-duty industrial shelves, AK can deliver. Only need one type of part for your shelving? You’re in luck; our shelving is sold as individual components rather than whole units, so you can custom tailor your order to buy only what what you need. It’s part of our commitment to helping you find the best storage solution for your unique requirements. If used shelving is more up your alley, we’ve got you covered on that end of things as well. We have a large in-stock selection of quality used industrial shelving in a variety of sizes, colors and capacities. Give us a call to find out more about our current selection. 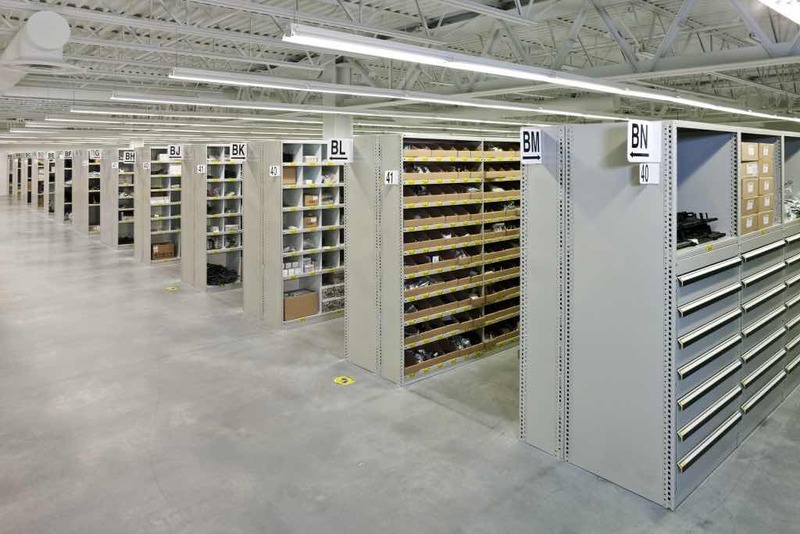 Industrial steel shelving is one of the most common storage solutions found in warehouses today. With an abundance of manufacturers located across the United States, such as Lyon, Edsal, Tennesco, Penco, Republic, Quantum, and Hallowell, things get complicated. Sometimes it’s hard to know which shelving is right for you. At AK Material Handling Systems, we analyize every application and find the best fit for our clients by taking full advantage of our network of steel shelving manufacturers. Flexible setup: with shelves that are able to be adjusted in 1 1/2 increments, you have the freedom to design your shelving unit any way you want. Ease of assembly: because no one wants to spend all day assembling shelving. Simply snap the shelf supports’ rivets into place in the upright posts, hammer into place and begin use. 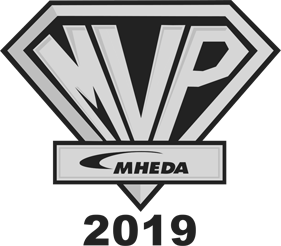 Best of all, there’s no hardware needed. Strength and durability: shelf supports are securely connected to sturdy 14 gauge steel upright posts, creating a strong, stable shelving unit. Added strength as necessary: for the heaviest applications and wider shelf levels, center supports can be added to shelves to ensure a secure support mechanism. 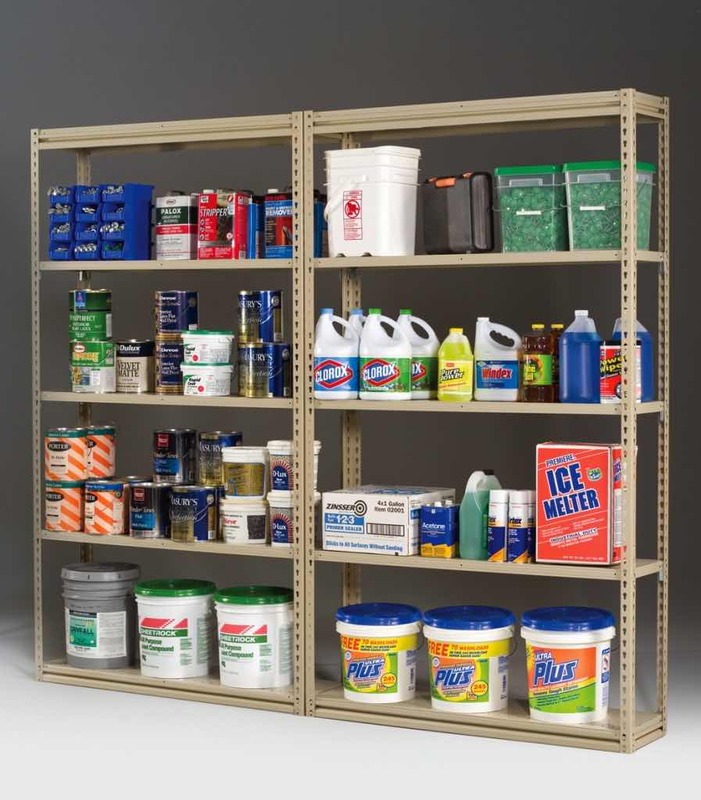 Cost-effective and dependable shelves: the strong, dense particle board shelves used in our shelving withstand the grittiest industrial applications and come at a price that won’t break the bank. 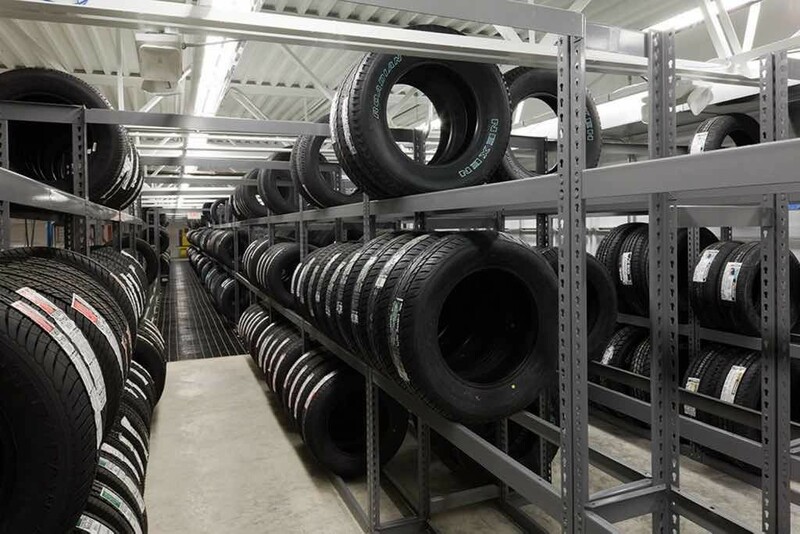 At AK Material Handling Systems, we stock three varieties of Tennsco Z-Line steel shelving, each of which are designed to serve a unique purpose. They range in capacity from lighter to heavier duty, but all of them have the reputation for quality and performance that has come to be associated with Tennsco. Not only does the shelving we carry have impressive strength and staying power, but its lack of hardware means assembly, disassembly and adjustment are quick and easy. The only tools you’ll need are a rubber mallet and a little elbow grease. Heavy Duty Shelving is made to hold up to to the most demanding industrial shelving loads, and uses 2 3/4 inch profile shelves to provide the extra strength needed to do it. The high strength shelving beams can also accommodate wire decking for ultra-heavy storage projects. Low Profile Z-Line Shelving allows you to make the absolute most of your vertical space by minimizing the vertical space used by shelves. These low profile shelves are a measly 1 1/8″ tall, maximizing the clear space between shelving levels. Despite being short, these shelves are strong, maintaining an impressive capacity of 500-800 pounds per level. Bulk Storage Shelving is another high-strength shelving solution for applications that require higher weight capacities. With an innovative Z-Beam design that’s specifically engineered to store heavy loads, Tennsco’s Bulk shelving can hold up 10,000 lbs. per unit.